My family loves Christmas trees so much that our hearts jump when we see the first tree lots go up before Thanksgiving. And it's all we can do to keep ourselves from bringing it home the day they go on sale. In years past, we've actually put up the tree promptly on December 1. But we won't make that mistake again. We've had too many Christmas mornings with the tree so dried out that we've been afraid to turn on the lights. Now we try to wait till at least three weeks before Christmas to get the tree. And we take it down on New Year's Day. As a result, we've become experts on prolonging Christmas tree life. It's our own little Christmas miracle. And we're delighted to share our Christmas tree tips with you. Do as we say, not as we do (or did) - wait till two weeks before Christmas to get the tree (if you possibly can). If you can't - well, keep the vacuum cleaner handy. Is It Better to Buy a Pre-Cut Tree, or to Cut Your Own? Is it better to buy a pre-cut tree (the ones in the lot) or to cut your own? Common sense tells you that trees are fresher if you march out to the Christmas tree farm and cut it yourself. With commercial lots, you never know how long it has been since the trees have been cut or how they've been handled enroute. Use the same freshness tests in the field that you would use in a commercial lot to test your Christmas tree before purchasing. Just because the tree is still stuck in the ground doesn't mean it's not stressed. Which Type of Christmas Tree Lasts Longer? Check it out: The tree shouldn't look wilted or have brown needles. Bend the needles: If the tree is fresh, the needles will bend instead of break. Shake the tree: It's natural for some needles to fall, but not too many. Measure: Get a tree that's at least a foot shorter than the ceiling that will eventually be above it. Remember that the stand will add height. And since you pay by the foot, you don't want to trim that extra off at home. 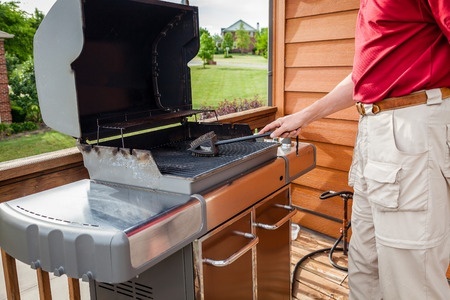 Examine the trunk: The trunk should be straight so that it will fit in the stand. Also the diameter of the trunk should fit easily into the tree stand. If you have to whittle away bark to make it fit, the tree is just going to dry out even sooner. 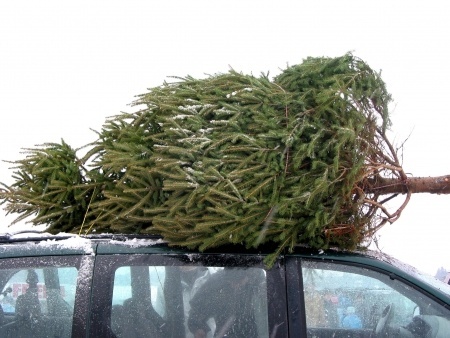 Once you've selected your tree, ask the attendant to cut one inch off the base at the lot. A fresh cut enables the tree to take up water. As soon as you get home, place the tree in a pail of water because the sap will seal the pores again in 4 to 6 hours. If you aren't going to put the tree up right away, put it in a cool place that's protected from sun and wind. Just before you put the tree in the stand, cut another half-inch off the trunk. How do you care for your Christmas tree to keep it from drying out? Location, location, location: Place the tree in a location that's away from all heat sources and the sun. Protection: Put plastic sheeting under the stand to protect the floor in case of spillage. Place your Christmas tree in a location that's away from all heat sources and sun. Hydration: Place the tree in a stand that holds at least a gallon of water and fill it with warm water to keep pitch from forming. Vigilance: Check the water supply a couple times a day - especially in the beginning when the tree can absorb a gallon a day. Check twice as often if you have pets who might consider the tree stand a new water bowl. As long as your tree is taking up water, it's OK. None of the additives such as aspirin, sugar, etc., really help much - just keep the water coming. Spray the tree with an antitranspirant that keeps water from evaporating from needles. Use treatments that retard flammability. Use miniature lights. They burn cooler. Never leave a lighted Christmas tree unattended. Follow these steps and hopefully, you'll have a Christmas tree that you can actually light on Christmas morning.